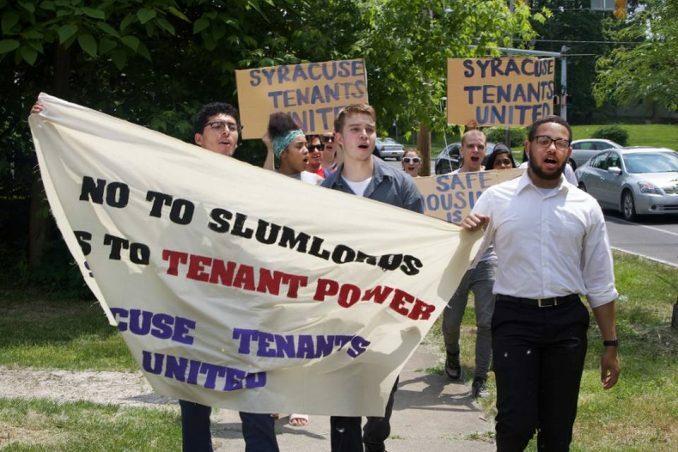 Syracuse Tenants United held a march, rally and press conference June 1 to announce that a group of Syracuse Quality Living tenants will continue their rent strike into June. The SQL is a major landlord in the Syracuse University area. The 10 SQL tenants withholding rent have experienced infestation, mold, lack of heat in the winter and maintenance personnel entering their apartments without notice. Tenants marched to the company office and read prepared statements to the press and supporters. An SQL employee called police on the lawful gathering, and three police cars arrived shortly after. “It is evident that SQL doesn’t care about the well-being of its properties, maintenance staff, or especially its tenants,” said Isaiah Nins, a rent-striking tenant, following the event. The tenants plan to withhold rent until management meets their dire habitability needs or voids their leases.